¿Quieres Educar a Sus Hijos en Casa? 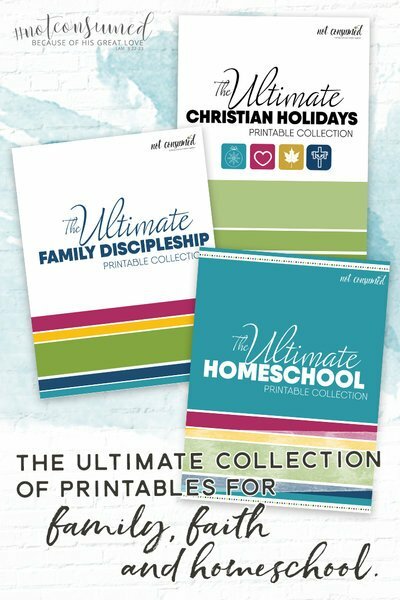 The Lemonhass® Homeschool curriculum is a Christ centered, literature based, homeschool curriculum (completely in the Spanish language) designed especially for Spanish speaking, home educating families. Offering a detailed teacher's guide, complete with daily assignments in all subjects for 36 weeks (180 days) of classes, Lemonhass® has done all the work to make homeschooling easy for the new and experienced homeschool parent. Families purchase a packet, including a teacher's guide and basic books for that grade level, and then add on any or all of the additional materials for a complete learning experience. Grades available: Preschool, Kindergarten, First, Second, Third, Fourth, Fifth and Sixth And currently all new subscribers to the Lemonhass® news and blog get a free download of the homeschool attendance form! The Christian Homeschool Movement in Mexico has been alive for as much as 25 years, perhaps longer, but struggling along with little encouragement and fewer resources. Mike Richardson and El Hogar Educador Ministries have played a huge part in educating hispanic families on the benefits of Home Education. In 2011 their magazine reportedly reached 4,500 families in Mexico and 34 other Spanish speaking countries. Their homeschool conferences in Mexico have had as many as 800 families in attendance at a single event! Home Education is legal in Mexico by default, meaning that it is neither protected nor prohibited by current law, and each state has it’s own regulations (much like the USA). Homeschooling is currently very loosely regulated, and official school credit can be earned by homeschoolers through the government’s INEA 10-14 program. HSLDA has estimated that there were 5,000 families homeschooling in Mexico as of 2013 and it has been predicted that the Homeschool Movement in Mexico will experience a boom in the next 5-10 years similar to that the USA experienced in the 70’s and 80’s. Today’s college students will be tomorrow’s homeschool families. 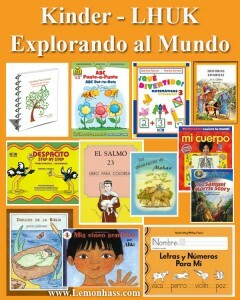 There is a great need for quality homeschool materials in the Spanish language. While the USA abounds with curriculum options, the choices are slim for the non-English speaking family. Not only is there a limited amount of curricula available in Spanish, but the complicated process of ordering many of them in English from providers outside of Mexico and importing them can also be problematic and/or cost prohibitive. Tap & Katie Hornor have been missionaries in Mexico since 2007. God has uniquely gifted and positioned them for this task, and has given them a burden for and vision to meet the Spanish homeschool curriculum need by creating a Christ-centered, literature based, homeschool curriculum in the Spanish language. 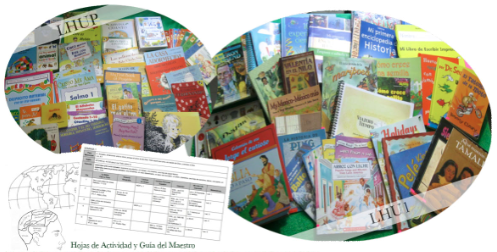 The Lemonhass® Homeschool Curriculum uses Spanish language living books and a few text books already in print by compiling them into a program that meets or exceeds Mexico’s Secretary of Public Education’s grade level standards. Each basic unit comes with a complete, easy to follow, step by step teaching manual for the parent, books and resources to educate at home one child for one full grade level year. Parents who want a richer experience can add on any or all of the suggested materials for that grade level. The best part – it’s possible to use one package for multiple children (with only minor adjustments) and the entire package can be reused with younger children in the home with very little additional expense because 75% of the materials are non-consumable, they are real books! This reduces the costs to the parent by 50% or more depending on how many children will use the curriculum. If you would like to contribute to the Lemonhass® curriculum development fund, or provide funds to supply curriculum aid to full-time Christian service families, you may contact us and request the information. The Hornors have been diligently advancing the Lemonhass® curriculum since April 2012. HSLDA, The Ultimate Homeschool Expo, Homeschooling Today Magazine, The Ultimate Homeschool Radio Network, Florida Parent Educators Association and several homeschool bloggers, curriculum companies, and homeschool conventions are also helping to promote their curriculum. 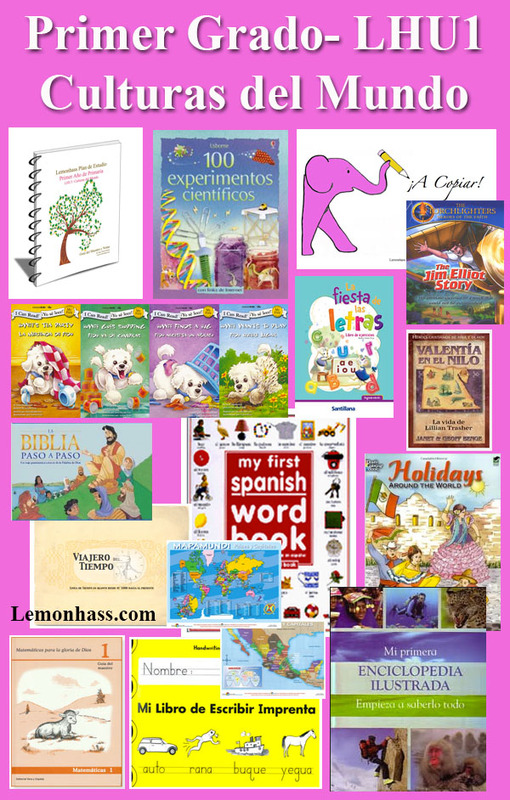 In August, 2012, the Hornors opened Lemonhass.com, a Christian Spanish online bookstore from which homeschoolers can purchase the curriculum as well as other quality Spanish materials. The curriculum is offered at a price comparable to the average cost of a year's tuition at a Mexican private school. 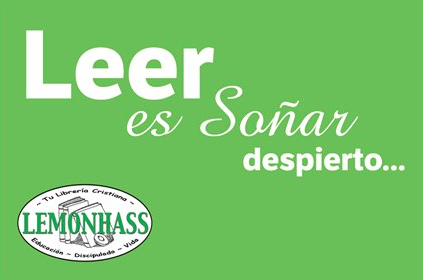 Also in August, 2012, Lemonhass® launched a homeschool blog in Spanish, for the purpose of informing and encouraging Spanish speaking home educators around the world. The blog now consists of an editor multiple volunteer homeschool bloggers who submit their work to be translated and re-published in Spanish at Lemonhass® for the continued encouragement and education of home-educating parents. Pre-school through Sixth Grade teacher's guides and student materials are available for purchase in physical or digital copies at Lemonhass.com, along with their respective books and resources to complete the grade level packages. 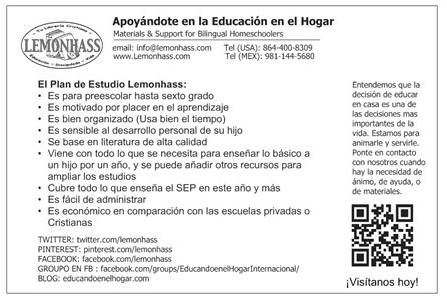 Homeschoolers in Mexico, Costa Rica, USA, Argentina, and Ecuador are already using the Lemonhass® curriculum and we've have had inquiries from a dozen other Spanish speaking countries! 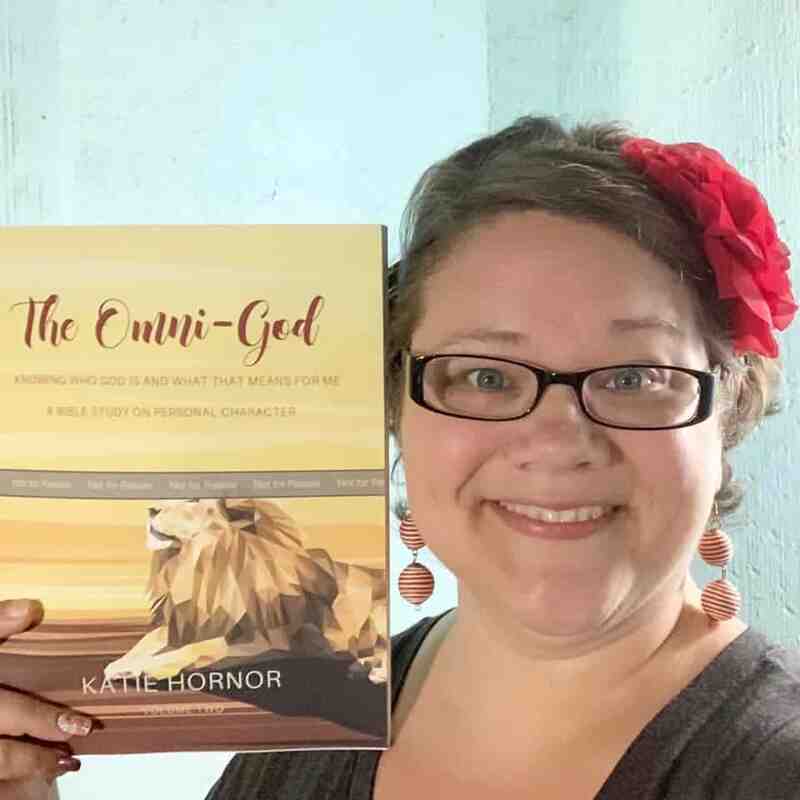 The Hornors have also been privileged to speak to homeschoolers and to take the curriculum to several conferences/conventions each year since their beginning. (They would love to meet you at one of them!) See their conference and speaking calendar here. Would you like to partner with Lemonhass? You can make a difference for the next generation and impact the history of the Spanish Homeschool Movement by partnering with the Hornor family in the advertisement of this curriculum, as well as the encouragement and training of parents. Just sharing the news with those you know is appreciated. But Lemonhass® does also have several sponsorship options available. Contact us for details at info@lemonhass.com. 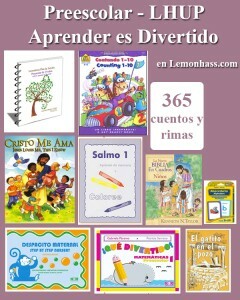 Order your Lemonhass® Spanish Homeschool Curriculum. You may also share this project with your friends by tweeting this or using the share buttons below this post. 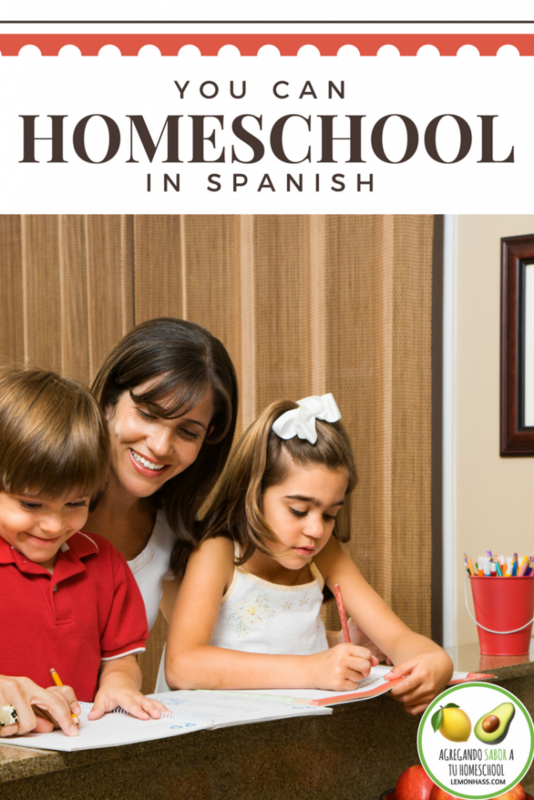 #Homeschool curriculum in the #Spanish language. 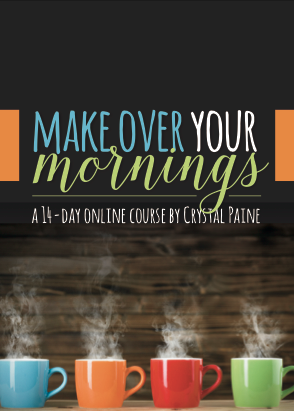 Click now to check it out! Want to keep up with our ministry? Visit TKHornor.com to sign up for our ministry update emails or for donation information.